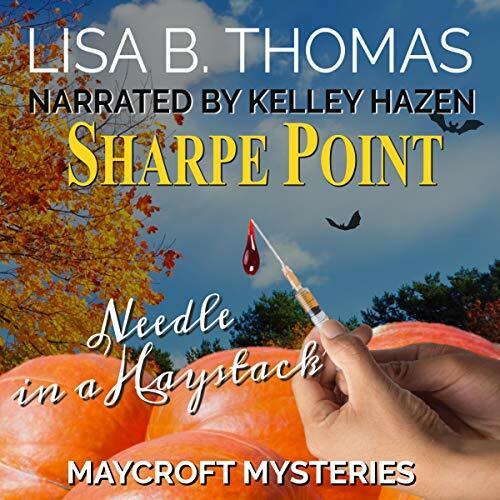 Lisa B. Thomas’ Sharpe Point is the fourth book in the Maycroft Mystery series, a clean whodunit with plenty of snarky humor and a touch of romance. Buy it today to join in the fun. 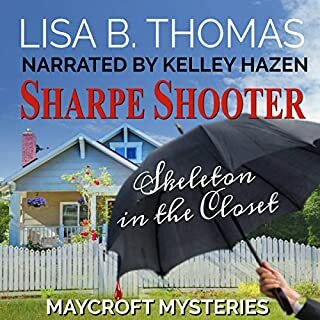 Sharpe Point (Maycroft Mystery #5) by Lisa B. Thomas was a great read. Deena Sharpe finds a dead body at the haunted house at the church's Halloween Carnival. She starts to prove a defense attorney's client did not kill the man. I enjoyed reading this book. Narration by Ms Hazen is very good; it adds an emotional layer to the book, allowing you to relate to the feelings of the individual characters much better. I especially loved her interpretation of Sylvia - the voice given to that character just tells you everything about her and makes her sooo real in her cute annoyance (yes, it's possible to be cutely annoying:)). I love this series! Lisa B Thomas has written a series that has some very endearing characters. Each book is a standalone listen, yet brings familiarity of characters and setting to the listener. I enjoy the main character of Deena so much, and found myself laughing out loud at times. Kelley Hazen is the perfect narrator for this book. She delivers the right emotions and humor flawlessly, plus has distinguished voices for the various characters. I will definitely listen to more books by this author and narrator in the future. I thought this was a fun mystery story that was easy to listen to. The narration is well done and the characters are engaging. Although this is the fourth book in the series, and my first story in it, I was able to easily jump right in and follow the story. I didn't really feel lost at all. 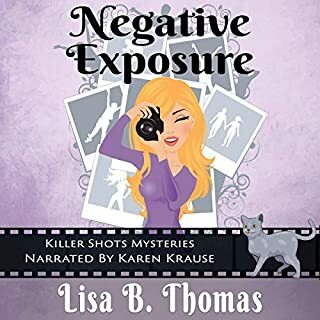 This is a great book; this is the fourth book in the Maycroft Mystery series and is written by Lisa Thomas and narrated by Kelley Hazen. Deena Sharpe is a retired teacher and is now a rookie investigator, she wants justice for the wrongly accused. When she trips over a dead body in the church’s haunted house the police try to pin it on one of her clients. 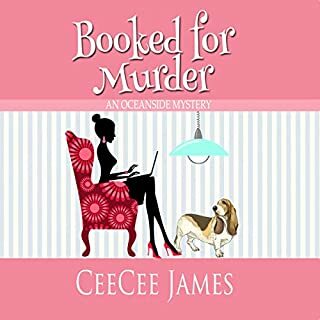 She is determined to prove her client innocent and find the real killer. This is a great book with a wonderful story and well developed characters. This book will keep you listening long into the night. If you are looking for a great book, then you need to read this book. I really enjoy this narrator, she is one of my favorites. She does a fantastic job with all the voices and kept my attention until the end. I was voluntarily provided this free review copy audiobook by the narrator and found it very entertaining. Life is never dull for Deena Sharpe, a retired school teacher turned investigator. Deena finds her next case by tripping over him in a haunted house. Through a series of misadventures Deena tries find out what happened to the town drunk. 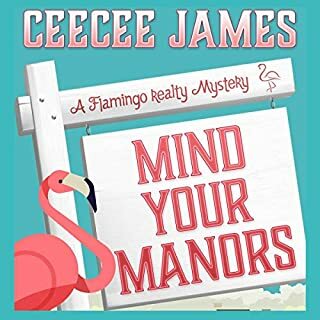 The suspense and humour never stop in this delightful tale set in small town Texas. Looking forward to the next book. In <strong>Sharpe Point</strong> by Lisa B. Thomas, Deena Sharpe gets embroiled in another murder case when she stumbles over a body at the haunted house at her church's Halloween carnival. Ray Brewster, the church's janitor with an unsavory reputation, lies dead. Soon, Deena's best friend's husband, Ian Davis, calls her in to his law office with a new investigative job. Though no post- mortem has been completed, a client of his in the midst of pressing harassment charges against Ray, Wendy Fairmont, is suspected of having killed the man. Then it comes out that Ray was blackmailing Wendy, a former beauty queen, now a wedding planner. The pressure from Mayor Thornhill for an arrest in time for his upcoming election forces Detective Gutmann to arrest Wendy. But even he soon suspects Wendy has been set up, so he too turns to Deena for help in finding the truth. <strong>Sharpe Point</strong> was a fun book to listen to with enough humor and cleverness to make it highly enjoyable. I particularly liked the character of Sylvia, Deena's mother-in-law, who has always been highly critical of Deena's care of Sylvia's son, Gary. The characters in this book come alive and seem real, especially the details of how Deena wakes up unkempt, unlike the stars in movies. The plot has fun elements, with a creative ending that came as a surprise to me. Kelley Hazen performs the audio version of <strong>Sharpe Point</strong>. Her female voices sound good, but though I have liked all her narration in previous books, several of her male voices came across as annoying. This was especially true of Deena's senior citizen neighbor, Edwin, and Charlie Abbott, son of the Reverend Abbott. However, I did appreciate her narrative parts. I enjoyed <strong>Sharpe Point</strong>, appreciating the many fun characters and plot points. I look forward to the next book in the series and give this one five stars! <strong>Disclaimer:</strong> I received this book for free for review purposes, but that had no effect on the content of my review. 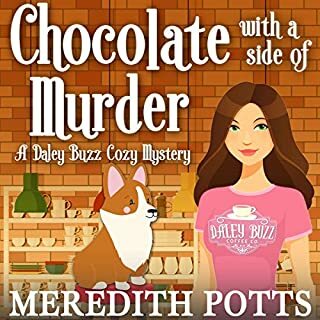 The Maycroft cozy mystery audio books narrated by Kelley Hazan mix the right amount of charm, quirk, spooky murder mystery, and well, coziness to make this a series you'll want to follow. Prime example from the opening chapter of this installation in the series... The main character bakes a cake under the strict supervision of her persnickety mother in law (a master baker) to bring to a church Halloween cake walk. Wacky events unfold (which they are want to do in Maycroft) and a large man falls dead atop the cake. As the character is explaining the situation to her husband and mother in law later that evening her mother in law questions how badly the deceased's head squished the prized cake and whether or not it (the cake) could have been salvaged. If lol moments like that don't sell you on the series than the fact that Hazan delivers these memorable lines with a fantastic array of voices should. Thank you to Ms. Thomas, Ms. Hazan, and audiobook boom for the complimentary copy of this book. I have left my unbiased review here of my own accord. A murder mystery has never been so funny! Be prepared for a ride. This is a murder mystery, of that there is no doubt. But the plot is also quirky and hilarious with all the idiosyncrasies of small town politics. 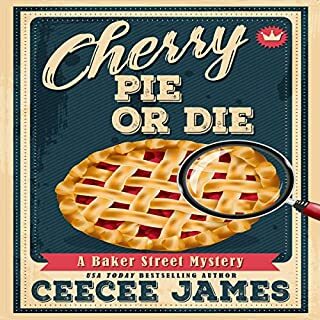 It is, quite literally, a murder with lots of suspicious characters and a dollop of icing. Dina has her hands full between her boss, her mother-in-law, her pregnant friend, a maybe stalker, the police and, of course, the murder. Nothing is ever quite what it seems, most especially the outcome of Dina's investigation. But what do you do when the victim himself is worse than any of the suspects?